As well as brightening up our living room, our choice of art also reflects our interests and personality. 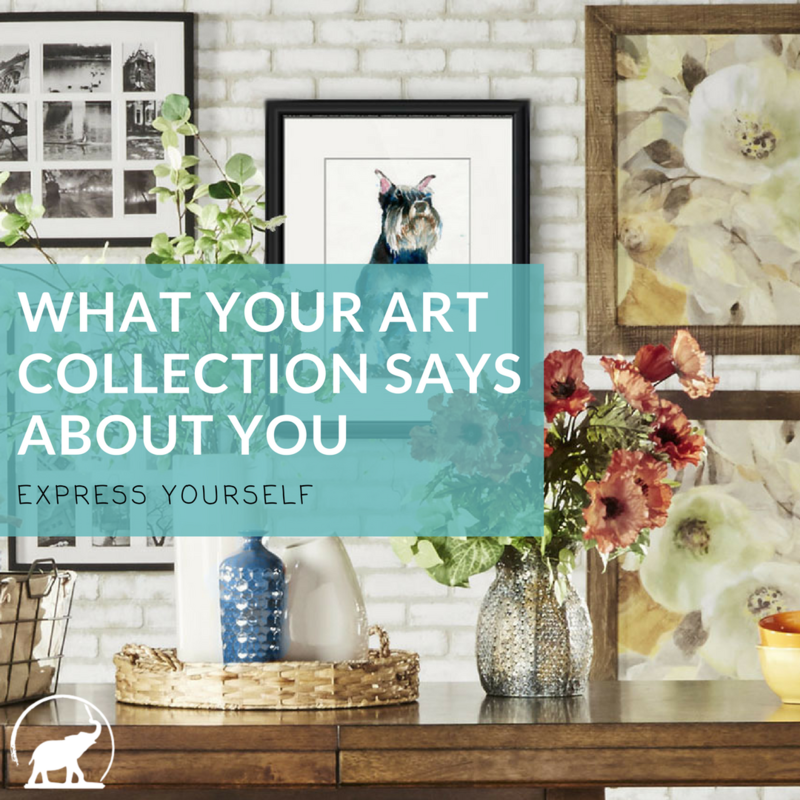 Having original art in your home is a powerful way of stating who you are to the world. Art is a conversation starter, and a powerful way of spreading positive messages. When you surround yourself with art that expresses your personal tastes, it turns your home into a sanctuary that you enjoy spending time in. I've found that my art collectors will find themselves drawn to animal spirits for their potent mystical powers. Let's take the story of Jennifer. Jennifer was looking for a piece of statement art for her eclectic dining room. I love her choice of gray chevron upholstered chairs and the bright yellow pillows. The peacock she chose for her home was already in my portfolio and she was attracted to the combination of teal and mustard. Jennifer is a strong, modern professional woman and this peacock helps express that in her own home. The surface of the painting is treated in a fashion similar to what you might see in a Gustav Klimt painting (think Woman in Gold, and the Kiss). 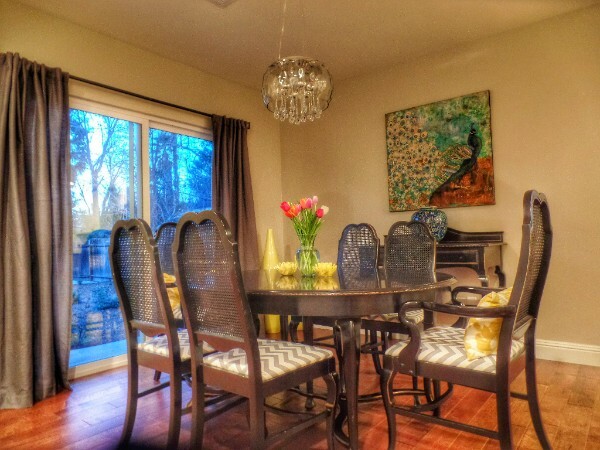 You also may recognize the painting in her dining room from my email header! 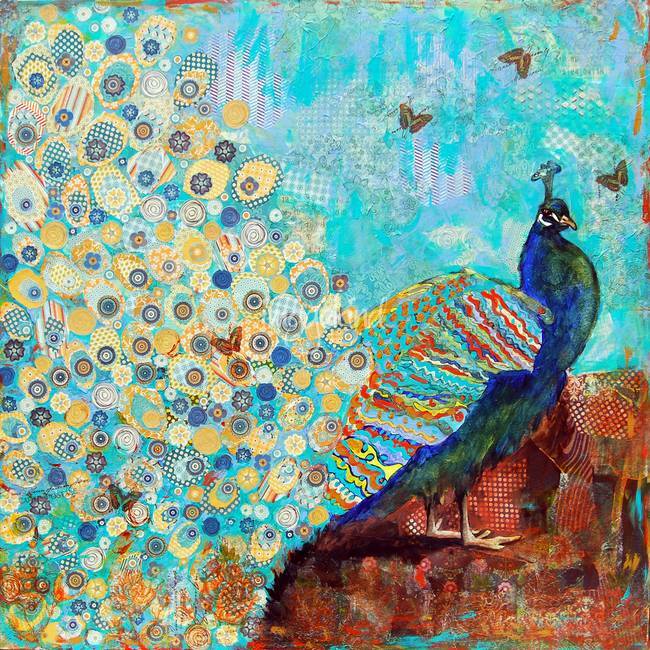 Although the original painting is sold (there is only one) I still offer prints of this peacock on my website. Jennifer was just thrilled with the painting and says she gets lots of compliments on it. More importantly, it serves a symbol of her personal power. Peacocks are a symbol of integrity and the beauty we can achieve when we endeavor to show our true colors. "I am so in love with this painting, and the colors could not have matched better! Everything went smoothly. Thank you again! Your painting will be loved!" Enjoy the beauty and enchantment of delicate tulips all year round. The colors will fit into your modern decor and add the pop of color your home craves without dominating the room. The decorating suggestions shows the large modern canvas art over a mid-century modern sofa by West Elm. This painting will also be right at home in more neutral decors. The long and narrow size makes it perfect for over a headboard, a sofa or a banquet. The colors are subtle with pops of color to add personality to the room. Now the rest of this story is like a choose your own adventure with you at it's center. 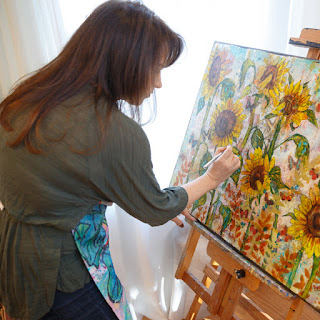 You can commission a painting with the perfect size, color story and genre that speaks to your personality. Ready to talk to me about that? Art in my portfolio is always less than custom art so a great place to start. 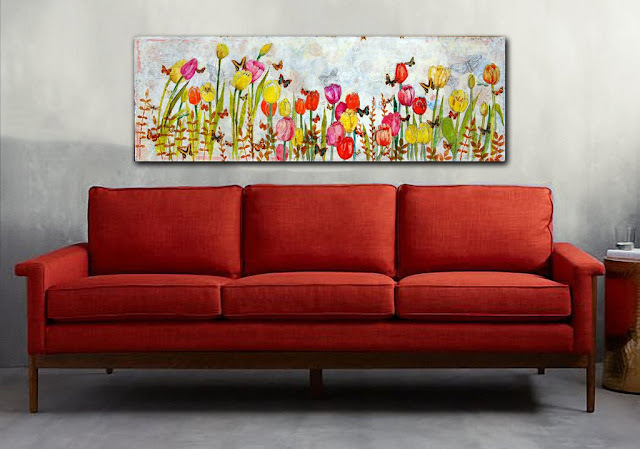 If the luxury of original art is out of your reach, you can also consider a custom canvas print to mimic the look of original art.